Introduction: The Convention on the Rights of Persons with Disabilities (CRPD) has been touted as a major breakthrough towards achieving equal rights for persons with disabilities. The promulgation of the convention provided clear guidelines for signatory countries to revise their legislation as well as to formulate policies that will take into consideration the needs of persons with disabilities. As Cameroon is a signatory to the convention, it is expected that disability-friendly policies have been implemented to enhance the living conditions of persons with disabilities. 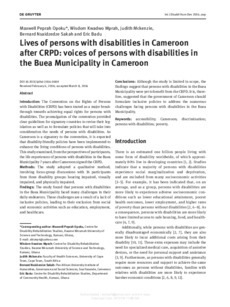 This study examined, from the perspectives of participants, the life experiences of persons with disabilities in the Buea Municipality 7 years after Cameroon signed the CRPD. Methods: The study adopted a qualitative method, involving focus-group discussions with 36 participants from three disability groups: hearing impaired, visually impaired, and physically impaired. Findings: The study found that persons with disabilities in the Buea Municipality faced many challenges in their daily endeavors. These challenges are a result of a lack of inclusive policies, leading to their exclusion from social and economic activities such as education, employment, and healthcare.